Most men prefer to wear kurta pajamas for family functions and events. Be it marriages or cultural events, for men, the choices in ethnic wear are quite limited and restricted. One of the most royal outfits in traditional wear for men is Sherwani. A sherwani is rightly considered the most royal outfit in traditional wear. This particular outfit consists of a long coat like attire and a churidar. However, wearing a sherwani is not as easy as wearing a kurta pajama. If you want to don a sherwani make sure the occasion is apt for it. Mostly, sherwanis are worn by grooms but these days the simpler variations are worn by others too. This outfit is now available in Indo-western styles too. 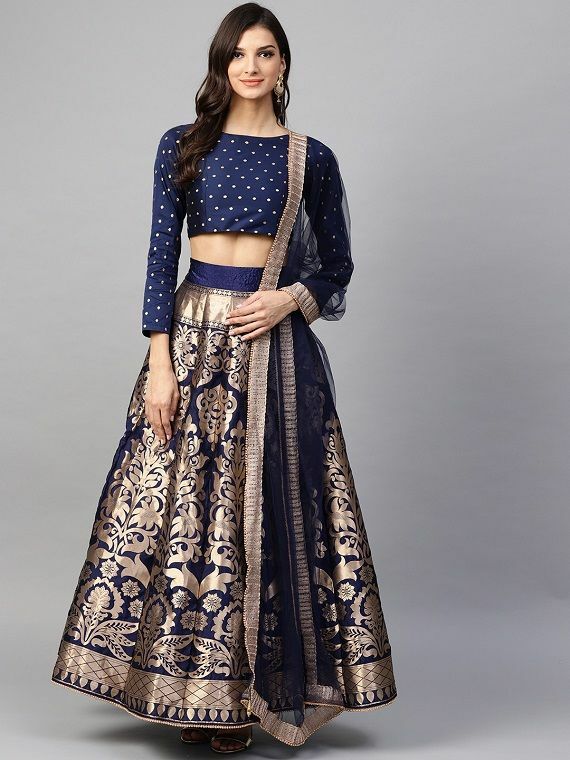 The heavy-laden embroidered sherwanis are worn specifically for weddings but the sherwanis which are contemporary can be worn for sangeet ceremonies too! Earlier, sherwanis were worn only by the royals and since then this Indian outfit has become a symbol of elegance and royalty. Along with the customisation of the sherwani, people these days experiment with the bottoms too. In Indian outfits for men, kurta pajamas are the most comfortable attires, however, the charm of the sherwanis is unbeatable. Initially, it was extremely difficult to style a sherwani because one had to wear a traditional churidar beneath the sherwani. Additionally, only a few set of colours were available for sherwanis. Nowadays even in sherwanis, the concept of mix and match has arrived. Moreover, these attires have now become versatile in terms of styling. Several Bollywood actors also swear by this attire. 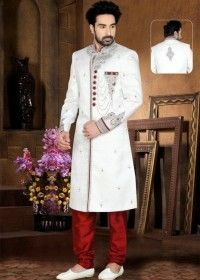 Most designer labels now exclusively deal in mens sherwani. When it comes to traditional attires for men, several men look up to Bollywood stars. Actors like Ranveer Singh, Varun Dhawan, Salman Khan and Ranbir Kapoor have time and again given many variations to this outfit. Here are some style tips to wear a sherwani the right way. Sherwani is available in a variety of fabrics. Velvet is one of the richest fabrics in today’s times. This particular material looks extremely classy and royal because of its unique texture. Sherwanis look the best in velvet. However, make sure you choose the colours carefully when opting for a velvet sherwani. Opt for colours like dark blue and maroon when choosing a velvet sherwani. Usually, this kind of sherwani is worn for weddings but one can wear this for a reception event too. Also, the bottoms have to be chosen carefully when selecting a velvet sherwani. If your sherwani is dark-hued opt for a classic white bottom churidar or go for straight white trousers. Additionally, see to it that you pair your outfit with perfect footwear. Sherwanis these days are worn with a Nehru jacket or waistcoat. If your sherwani is plain and simple and you wish to add an element of drama to it then go for a waistcoat or a Nehru jacket. Well, make sure that your sherwani is quite simple because otherwise the jacket will not get highlighted. Colour coordination is also necessary when pairing up a sherwani with a Nehru jacket. The two attires should blend with each other in terms of pattern and colours though they need not be completely same. 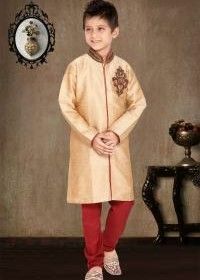 For instance, if your sherwani is beige in colour then you can add a crimson Nehru jacket to the same. Adding a Nehru jacket to a sherwani makes you look unique and contemporary too. This look is perfect for both daytime events as well as evening occasions. Choose light shades and combinations for day events and go for a darker tone for evenings. Usually, sherwanis are worn with straight pants or churidars. If you want to give a new look to the outfit you can also choose to go for a dhoti. The combination of a dhoti and a sherwani looks amazingly traditional. This particular combo is best suited for weddings. Well, make sure you are comfortable in a dhoti before opting for one. Just like sherwanis, even dhotis now come in a variety of shades and tones. You can either opt for a simple white dhoti or go for a shimmery black one for evenings. 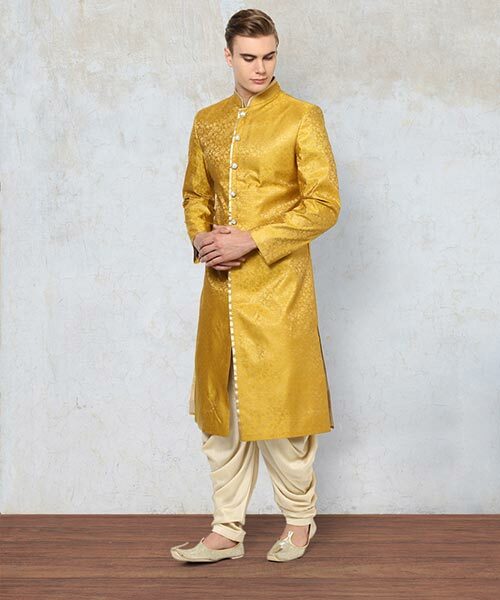 Some of the most common sherwani dhoti combos are yellow and white, dark blue and black, powder blue and white, etc. It is best to club this outfit with traditional footwear like mojris. Jodhpuri sherwanis are very much in trend these days. This type of sherwani gives a very ethnic look and is appropriate for wedding occasions. Jodhpuri style sherwanis are similar to other sherwanis but they typically come with a shirt like pattern wherein they have buttons. The buttons in a Jodhpuri sherwani are impactful enough to enhance the look of the overall outfit. Another element which is quite important for a Jodhpuri sherwani is pocket squares. A pocket square is a must-have accessory for every man. This accessory looks best on a Jodhpuri sherwani. A pocket square should match with the bottoms or should blend with the hue of the sherwani. This look is also perfect for a groom! You can also go for dark colours like maroon, midnight blue, brown, wine, etc when it comes to a Jodhpuri sherwani. The bottom for this can be of a neutral shade and you can then match your pocket square with the same. A dupatta can also be added to a mens sherwani. Most men think only kurta pajamas can be paired with a dupatta but even sherwanis look perfect with the addition of a dupatta. When you select a dupatta for a sherwani it is best to opt for a rich fabric because only then will it complement the outfit. The dupatta need not be of the exact same shade but it should blend with the overall outfit. Many dupattas also have borders which increase the attire’s traditionality. This combination is typically worn by grooms and is not recommended for casual occasions. You may look quite overboard if you go for this look for an informal event. Well, if you are bored with the boring dupatta you can also go for a shawl. If it’s a winter event and your sherwani is plain then an embroidered shawl can make you look very classy. The simplest look to carry is a monotone sherwani. Monotone sherwanis are not just easy to carry but they are also readily available. Most men get stressed out when it comes to colour combinations, however with a monotone sherwani you need not worry about the same. A monotone sherwani is nothing but an outfit of the same colour. Both the sherwani and the bottom are of the same tone. For monotone sherwanis, opt from the hues of grey, blue, pastel green and black. For this sherwani, you can also go for brogues as your footwear. Indian outfits have got innumerable modern twists. Cowl sherwani is the newest trend in sherwanis. This kind of sherwani has layers at the bottom which look extremely elegant. It is best to pair up a cowl sherwani with a light shaded churidar. A cowl sherwani is a concoction of traditional and contemporary which makes it a must-have outfit for a sangeet ceremony. The only accessory you should opt for when wearing a cowl sherwani is a wristwatch! Footwear plays a very important role in wearing this attire! You can drift away from the traditional footwear and opt for loafer shoes also. Usually, a sherwani looks like a long coat but a side slit sherwani has a slit on one of the sides. A pastel coloured side slit sherwani is quite modern in its vibe. 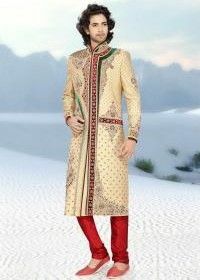 The most preferred pastel shades for this kind of sherwani are beige, mint green, peach, light blue, etc. This outfit is best for evening occasions and also for people who are not fond of extremely traditional looks. Pair up your pastel coloured side slit sherwani with a dark coloured bottom preferably straight pants and you are bound to make a style statement by all means. You can get these sherwanis online too. Once you have decided which sherwani to opt for, it is necessary to know about its styling and maintenance too. Here are some useful tips to follow if you are thinking of investing in a sherwani. 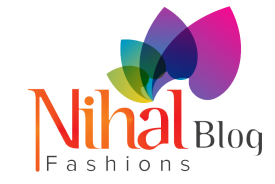 For all Indian outfits, the fabric is the most important element. It is necessary to choose the right fabric even for sherwanis. Sherwanis are usually made of rich fabrics like velvet, brocade, etc. However, see to it that the selected fabric is suitable for the weather and is also comfortable as per the occasion. The fabric of the sherwani will also influence the colour in some way because every fabric has a different finish in different colours. Additionally, not all materials look good on all patterns and designs so it is better to think about various factors when deciding on a particular fabric. Traditional outfits need a lot of care and maintenance. Sherwanis which have embroidery or embellishments are quite hard to handle and clean. When you invest in a sherwani it is best to ask about its cleaning. Usually, a sherwani shouldn’t be washed because the fabric might lose its sheen. 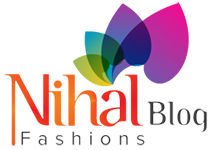 It is best to dry clean the outfits rather than washing them with harsh cleaners. Sherwanis need not be too tight or too ill-fitted. It is essential to try the outfit before finalising it. The fit of the sherwani has to be comfortable but also has to define the physique. Additionally, the churidar also has to be proper because only then will you be comfortable in the outfit. Every sherwani has a specific vibe to it in terms of colour, print and design. Make sure that all these elements are in sync with one another and are not out of place. All the elements in an outfit have to blend correctly for the outfit to look good. For instance, a large print on a very dark colour will make the outfit look weird. Additionally, make sure that the colour suits your skin tone and the pattern matches with your body type. Choose the prints which enhance your body shape and not the other way around. For instance, if you are on the heavier side avoid large prints and instead opt for minimal works. A sherwani is a formal attire but it doesn’t mean it has to be too simple. Sherwani being an Indian attire needs to have some striking element. However, make sure the outfit is not too heavy on the eyes. Strike a balance between the two ends and you are in for a perfect look. Also, it is necessary not to go very plain too because that can make you look very boring. Even for men, wearing a dupatta with sherwani can be a tough task. It is important to drape the dupatta right when opting for one. There are many ways to drape a dupatta but choose which draping style suits the pattern of your sherwani. Moreover, see to it that the dupatta does not hamper with your movement too! Wearing the Sherwani with a vest inside! Sherwanis can get uncomfortable too if not worn with a vest inside. If you wear a sherwani without any inner then you are going to witness irritation on your skin because of the shimmery and heavy fabric. Hence, it is best to wear a sherwani with a vest or a tee shirt. This method will keep you comfortable for longer durations! Hunting for the right sherwani can be time-consuming hence it is best to shop for sherwanis online. Choose mind-blowing sherwanis online and you are bound to get amazing deals too! Next article Next post: Useful Tips to Style Your Black Indo-western Outfits Effortlessly!